Nothing says spring like a freshly made pesto. I love the vibrant flavor and color of basil pesto. I had bought a bunch of basil for a recipe that I ended up not making, so I had to figure something else out for the gorgeous herb. When I got some kale in my CSA, I thought it would be a fun addition to the pesto. The kale was a little wilted after it’s long car ride from the farm, so it was the perfect way to use it. The kale adds just a hint of its dark greens flavor, but the overall flavor was definitely basil. If I’d been making this just for me, I would have used equal parts kale and basil, but since I wasn’t sure if everyone would like the kale flavor, I kept it at 1 part kale with 2 parts basil. I also forgot to add garlic which is traditional in pesto, so feel free to add 1-2 cloves of garlic if you like that. Cook pasta according to package directions, making sure you salt the water well to help flavor the pasta (I find this even more important if you’re using whole wheat pasta). While the pasta is cooking, make the pesto. In a food processor, combine kale, basil, pine nuts, parmesan, olive oil, salt and pepper, and process until smooth. Taste and adjust seasoning as needed. When the pasta is finished, drain it, reserving about 1/2 cup of the water just in case. 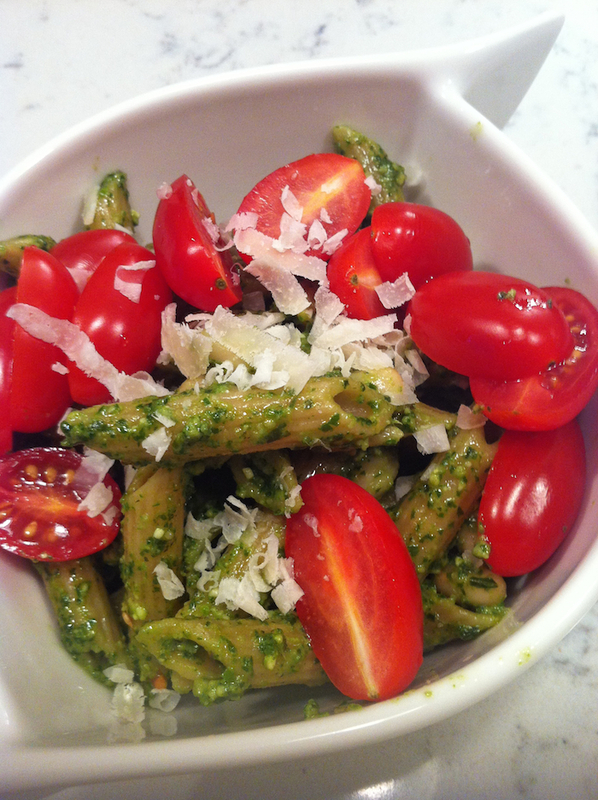 Toss the pasta with the pesto, adding some of the cooking water if you need to thin out the sauce a bit. Mix in the beans and tomatoes.